A great option for your second example is to get the 3 gallon black bucket from Home Depot, add a Gamma Seal lid, and drop it right inside the galvanized can. 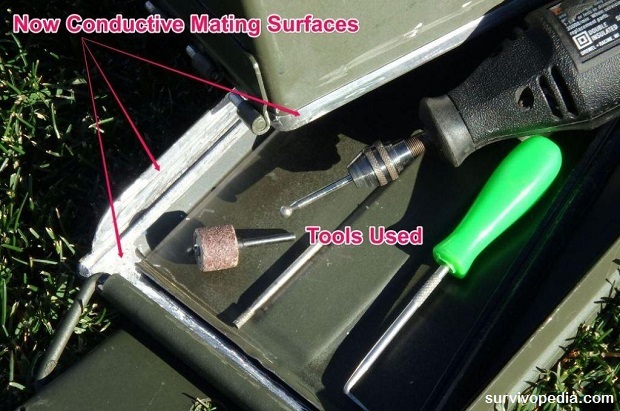 This creates a waterproof/dustproof insulating container inside the metal can which can easily be accessed at any time. Only mod needed is to pull the handle off the black plastic bucket so it will slip in the metal bucket. FYI, since those metal buckets are often used in suburbia for pet poop, nobody ever bothers them! That will work too. I prefer the large Faraday bags though, since it has all those same benefits and the added benefit of providing extra layers of EM shielding. Don’t pressure cookers have a gasket between the cooker and the lid, which would insulate the lid from the body and defeat the Faraday function? For metal trash cans, there are tiny gaps between lid and bottom through which high frequency energy can sneak. It’s effectiveness can be markedly improved by taping around the lid to the body with conductive tape. You don’t want ANY gaps in your Faraday Cage. A 1/4″ gap means any energy with a wavelength of less than 1/4″ (frequency greater than 47GHz) can get through. 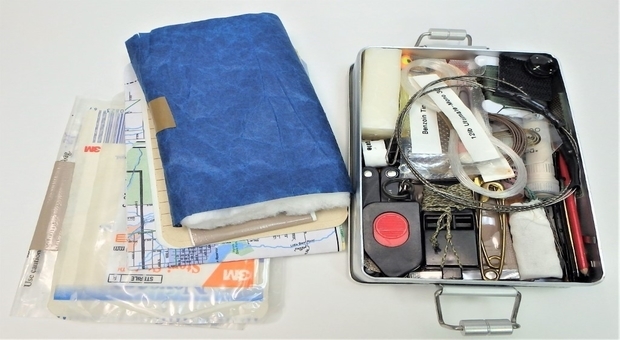 You mention “Faraday Bag” a number of times. I’m not sure what you are referring to. A true “Faraday Bag” is quite pricey, $200 or so each, but is quite adequate for EMP protection all by itself. 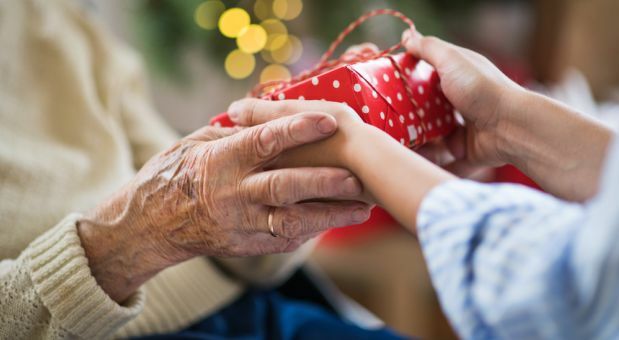 What you may be referring to are the bags used to protect electronics from static electricity, which are better than nothing, but I would not refer to them as a “Faraday Bag”. Will “conductive tape” assuming one can find it at a reasonable price, withstand the current of the EMP acting on the can/lid junction? Probably not, its purpose is to block high frequency energy from sneaking through tiny gaps, not to electrically tie the lid to the can. All that matters is that it has good conduction to the can and to the lid, and that the can and lid have good conduction to each other. I found it at Home Depot (Nashua 324A), and I don’t recall how much it was, but very likely less than $20 for a big roll which can probably do or redo at least 10 32 gallon cans. And there was a cheaper, narrower, shorter roll for less than $10, although I did not check to see if it had conductive adhesive. If you sprinkle fine metal powder unto the adhesive surface it would improve its conductive!!! But MOST people don’t realize is that the electrons of voltage “slides” over the surface of said conductor,so if you would roll under 1/4″ of foil tape on both sides to contact both lid and can would greatly increase it’s efficiency!!!! Yes, any form of conductive tape will be fine. The current is so brief in time that there will be very little heating, especially across a material with excellent conductivity. Most quality pressure cookers have all metal to metal contact without a rubber (non-conductive) gasket because … yes … that would impede the flow of electrons through the skin, disrupting the skin effect. So, no gasket unless it is conductive. A pressure cooker uses metal tabs that are formed into the lid and pot, and contact each other when the lid is turned to lock it closed, to hold the lid under pressure. These metal tabs would hold tight to each other and conduct, making the lid and pot connect electrically. I guess I’ve got a new-fangled one. The top has the metal tabs, but the bottom either uses some other material, or it has a non-conductive coating. My lid is electrically disconnected from it’s pot. Mine is aluminum touching aluminum. After I wrote that reply and posted it, I got to thinking there might be other types that don’t electrically connect. Yes, the gasket merely “Pneumatically” seals it. the metal fingers mechanically seal it by compressing the gasket. The fingers will conduct electrically between the pot and the lid. 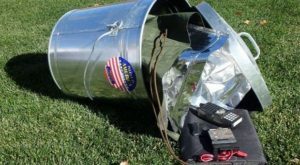 A similar way to build a bigger Faraday cage (from Home Depot at least) is use one of their Behrens 31 gallon metal garbage cans, and the slightly smaller (28 gallon?) rubber garbage can. You need to cut off the handles on the rubber can and the rubber lid to get them to fit inside, but aside from that, all that remains is to seal the lid to the can with the conductive tape (Nashua 324A, also from Home Depot). Just don’t forget to conductively tape the lip around the outer can. That makes a significant difference in shielding performance. Who has ACTUALLY built these and TESTED one of these suggestions against a device that would create an EMP? Results? Unless you have a way to run an actual test… it’s all speculative. I’ve built a couple of the 32 gallon sized ones with rubber can inside, and am working on a 32 gallon one lined with carpeting. The classic test is to put a radio or phone inside and see if it continues to receive a signal. Of course, an EMP will be very much more powerful and probably have a wide range of frequencies, but at least it provides some indication that the frequency used can be blocked. There is a video on YouTube where a guy uses a waveform generator outside and a spectrum analyzer inside to see the performance; this is where I learned about the conducting tape. Dr Arthur Bradley (a NASA scientist) wrote a great little book on EMPs and has some videos on You Tube. He used a professional lab and equipment (NASA’s?) to test various types of enclosures. 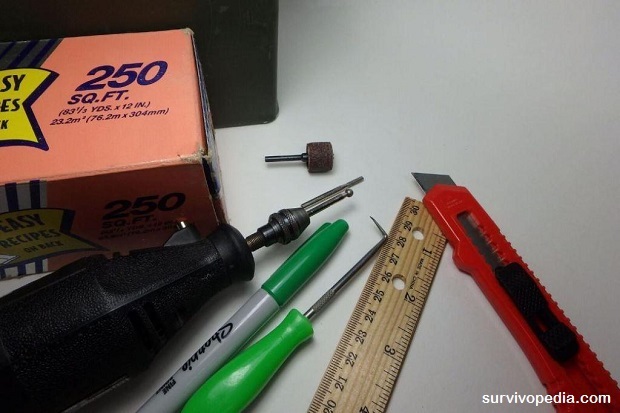 This is a great source to start with if you want to build a box. Very precise measurements. FYI, in one of his videos, he then demonstrates how to use a radio at home to test your actual build and clarifies the frequency range this tests for. One criticism I have heard of Arthur’s lab tests (from an Electrical Engineer who designed EMP shields for nuclear reactors) is that we need to picture the energy waves as spraying water. Arthur’s test hit the containers with waves from the side. It is realistic to believe most EMP and HEMP waves would be flowing Downward from a solar source or high altitude explosion. That brings us back to the galvanized cans. Picture a hose spraying the can from the side – water will likely work up into the small cracks around the edge. 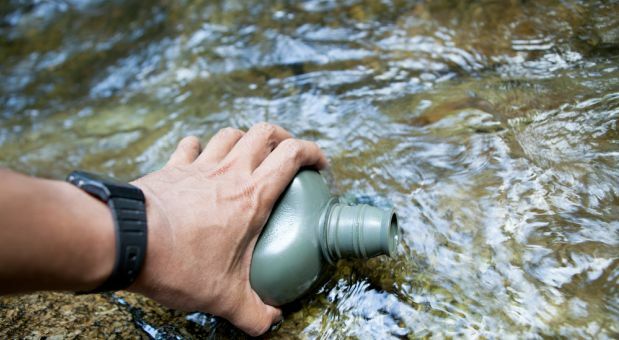 However, spray it from the top (or set it out in the rain all day) and the contents can be expected to stay dry. I am sticking with a galvanized can with a wire handle that pushes the lid down for a tighter seal. Is it possible that some energy would “bounce” and reflect upwards into the lid gap? Yes, but not any that is harmful to the frequency range of “victims” that we are trying to protect … as long as the lid gap does not exceed 1/4″. Creating an EMP simulator is best left to a professional RF test facility. There are, however, ways to measure the shielding effectiveness of these Faraday cages using RF generators, antennas, and a spectrum analyzer. I show this on youtube (see disasterprepper). 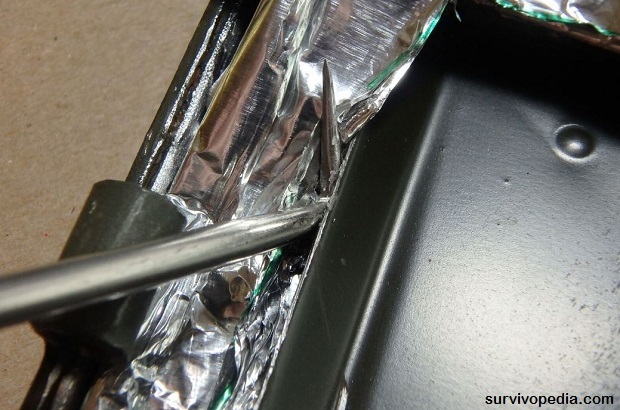 By determining the shielding effectiveness at different frequencies, one can reliably predict the field levels that the electronics would see inside. That in turn can help you to predict if an electronic item would be subject to damage. Thanks for reading and for the comments. I’ll have to check out your page. If you are coming out to PrepperCon I will be hosting classes. Please feel free to stop by. Principles of EM shielding are very well well understood and have been tested against all the EM effects that EMP causes. Tests are routinely done at White Sands, the EMP commission ran tests, and ATLAS and EMPRESS are examples of EMP test facilities and they exist for everything from communications equipment to autos, to planes, to naval vessels. Now having said that, it really depends of the type of EMP we are talking about. We didn’t understand the relationship between HEMP and Compton Scattering until after the Starfish Prime shot in the early 1960’s and we are still learning about high energy electrons and even lightening to this day. The chief weakness that I am aware of is that most tests are based on a maximum 50kV/m EM field strength and nations have had over 50 years to develop better and better Super EMP weapons, so the field strength could be much higher than we anticipate. We very well may not understand every mechanisms involved, but we do understand many of them. But what does that mean? Should we not prepare or shield anything because there could possibly be some effects beyond those that we understand? I think that would be as ridiculous not protecting ourselves against things that we know cause cancer because we haven’t found every single thing that causes cancer or not using lightening rods because we don’t understand everything there is to know about lightening … so do shield against the effects that we know we understand. If we discover more down the road … so be it. 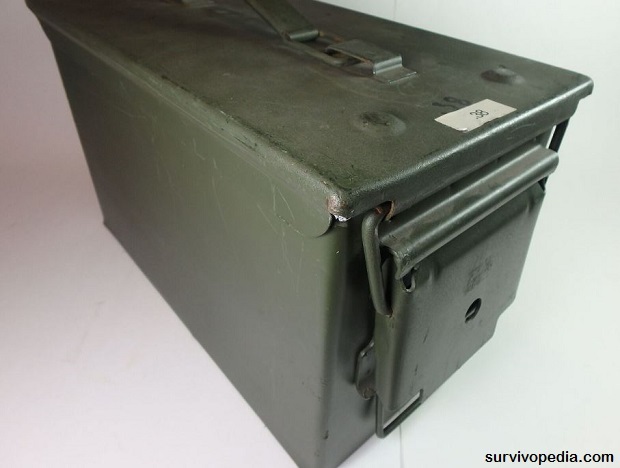 Instead of removing the ammo can gasket, you can take a short length of wire and two crimp-on ring terminals, and two screws/nuts and four washers, to electrically connect the lid and body. Drill a hole in the lid, and another in the body. Don’t make the hole any bigger than heeded for the screw size. Don’t use ring terminals any bigger than needed for the screw size. After drilling each hole,clean paint away from around the holes to give a place for the ring terminals to ground. Strip the wire, crimp a ring terminal on each end, and attach each ring terminal to a screw in a hole. That leaves the gasket intact, which lets the ammo can seal as intended. that way, whatever is inside is protected from other possible risks, such as moisture intrusion. And it ensures that the lid and body are electrically connected. I suggest that won’t work as well as you might think. EMP has a LOT of energy, and one little wire is not going to be enough. Plus, the gasket won’t be able to block the energy well, and some will sneak through. Also, that loop of wire will be an annoyance when storing or transporting the Cage. The wire size can be increased, but even then, I doubt an ammo can has enough surface area to generate enough current to burn the wire. A 12 gauge wire can handle 20 amps, according to what the National Electric Code used to say, and now some 12 gauge wire types are said handle more than 20 amps by the NEC. I seriously doubt there’s going to be 2 amps, much less 20. Probably more than enough to fry sensitive electronics, but not enough to burn a 12 gauge wire. Or 14 gauge. Or 16 gauge. And it would be a pulse, not continuous current. So not much heat generated (if any), because the amount of heat generated isn’t just based on current, but also the amount of time that current is there, along with the current capacity of the wire. The wire doesn’t need to be long. It can be attached so that it lays over the hinge when closed (to the lid in front of the hinge, to the back below the hinge), and short enough that it has little movement with the lid closed, which pretty much eliminates the chances of the wire getting caught on something. In addition to that, there would most likely be at least some conductance through the hinge. Unless, of course, the hinge is really rusted. If so, I wouldn’t use an ammo can like that to begin with. I just found one of my ammo cans. With the lid open, I was able to slide it to one side so that the hinge came apart (lid completely off), and then I was able to put it back together. With the hinge apart, it can be cleaned for better conductance. Then a nickel or copper based anti-seize can be put on the hinge pins. The anti-seize, with the nickel or copper in it, will further increase the ability of the hinge to conduct, in addition to greatly reducing the chance of corrosion. The thin edge of the can compresses the gasket pretty thin with the lid closed, so even with the gasket in place, there would be VERY little non-metallic gap there (I looked at one of my cans to verify this). And the lid wraps around the gasket (both inside and outside), so there’s no direct path through the gasket where the lid and can come together, without metal in the way on both side of the gasket. Even more so on the outside than the inside. Hopefully you are right about the wire. My impression is that the energy is best distributed all over the Cage, but that may well not be as important as I think. 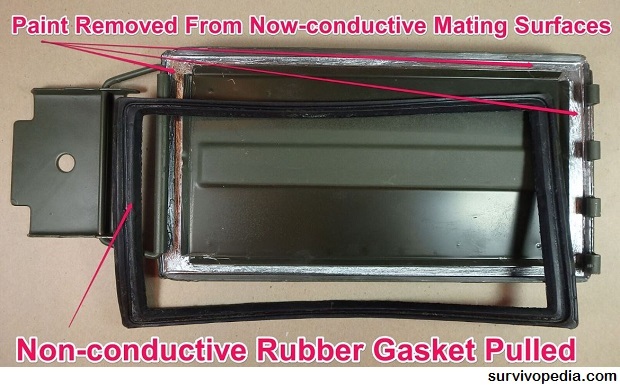 As for the gap imposed by the gasket, it is definitely bigger than the one left by the metal trash can lid, and without sealing it, the YouTube video shows that as a Faraday cage, the trash can is unimpressive. Only by sealing up that tiny crack with a conductor does it become realistic. I won’t claim to be an expert on EMP and EMP survival, as I’ve only started learning about the subject recently. I do, however, have a number of years experience with electricity and electric power generation as an industrial ICE (Instrumentation/Controls/Electrician) Journeyman. So I understand very well how electricity works. Plus, I was a Crypto Technician in the Air National Guard in a mobile communications unit, where the equipment, cables, mobile shelters, etc. were shielded to prevent electromagnetic and electrostatic emanations from communications equipment from being picked up by the enemy. This was necessary for communications security. That being said, I don’t doubt that EMP shielding has some differences compared to shielding to prevent electrostatic and electromagnetic emanations. But I’m thinking that much of the theory behind the shielding will be the same. I recall much of the crypto equipment cases having gaskets to seal them. 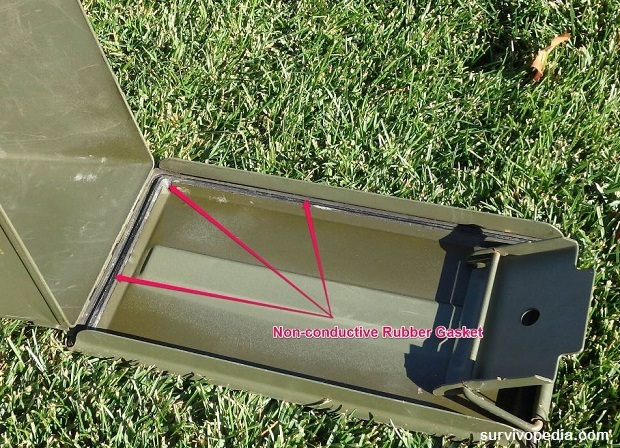 But like the ammo can lid, there was no direct (as in straight) path through the gasket. And the bolted on equipment case covers had the bolts to make them conduct electrically. That said, I think the wire is more than adequate, even more so if the lid is removed, the hinge cleaned, and nickel or copper anti-seize used on the hinge pins, which would help the hinge conduct also. Absolutely not. HEMP has a lot of high frequency content to it and that wire will effectively be an open circuit much over 1GHz. Okay, so explain how a wire electrically attaching the lid to the case, along with whatever the hinge conducts (especially if the hinge pins are cleaned and nickel or copper anti seize is applied to them), along with whatever the lid latch conducts (it makes contact too) won’t conduct over 1GHz, but a metal gasket electrically attaching the lid and case will. Metal is metal, and as long as the contact/connection points/wire are clean and tight, as well as sized big enough for the current being conducted, I submit that there would be no problems. I might be wrong though. Question: If the wire wouldn’t conduct at over 1GHz, then why would the case and lid conduct at the same frequency? I understand the value of shielding, but electricity should follow the same rules regardless of the conductor. I don’t claim to know everything about EMP, as I’m still learning. That’s why I want an explanation, preferably supplied with a supporting electrical theory formula. But I do have more than 23.5 years of experience directly working with electricity and electric power generation, as well as USAF basic electricity/electronics training, and that’s why saying the wire would be an open circuit at 1GHz or more makes no sense. What you’ve described is good for lower frequencies, but everything you know about electricity as it pertains to electrical distribution goes out the window once you start getting into the radio frequency spectrum. The inductors you deal with for say power factor correction are large and have hundreds of turns of wire around laminated steel cores. The amount of reactance it creates is dependent upon frequency, so one which creates the right amount of correction at 60Hz wouldn’t be right at 50Hz. Once you start dealing with RF, however, at best you’re using powdered iron cores and in many cases just air for the core. Taking the shortwave spectrum, coils might go from a couple dozen turns at 2MHz to maybe a handful at 30MHz because as you go higher in frequency it takes less turns to get the same amount of inductive reactance. Once you hit UHF frequencies, your “coils” are nothing more than strips of metal. An inch of wire at 1GHz has as much inductance to that frequency as one of those PFC chokes do at 60Hz. Additionally, at those frequencies the current flows only on the surface of the conductor, known as the skin effect, which creates even more reactance. I’d encourage you to study ham radio electronics theory, particularly as it pertains to inductance and capacitance. It’s a whole ‘nuther world above 20KHz. No, I’m sorry, but it won’t work. The reason is that that electrons need to flow freely through the entire skin of the cage without resistance in order for the “skin effect” to work and the gasket prevents the free flow of electrons. A single wire wouldn’t help. You would need about 20 wires per inch the size of 20 opi steel wire mesh along every mating surface and that would make for a very time consuming project. What theory are you operation on? Faraday discovered that the charge (induced or current) flows on the surface of the conductor. If you seal a galvanized can with conductive tape, and there are no openings, there is no charge or current on the inside of the can. You don’t need to insulate the material inside from the interior surface IF THERE ARE NO HOLES in the can. Galvanized cans and conductive tape are the way to go, IMO. I agree that if ammo cans are used (I use the 20 mm cans), gaskets and paint need to be removed and foil gaskets need to be used. The problem is that if you are using the stuff inside, it can be a pain to reseal the cage after every usage. And you certainly hope that a HEMP doesn’t take place while the cage is open. I’m operating on the theory that much of the current flows on the surface, but that some will penetrate (because thickness of the Cage walls is a factor and none of the solutions are really very thick). Some of the penetrating energy may “bounce” off the inner surface of the conductor, but some will get through. Hopefully not enough to get through the insulation. Yes, really a pain to access. For things which need regular access, there are conductor-lined nylon bags which have Velcro closed roll tops, which are moderately easy to get into and reseal. However they cost more than $200 each and are not really all that big. 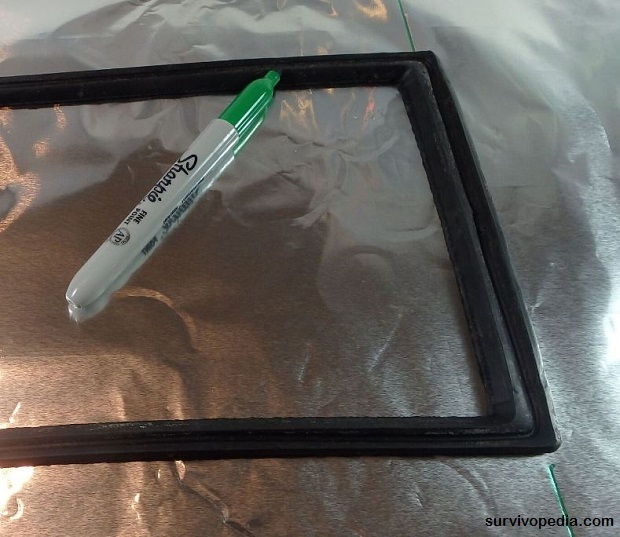 Doesn’t the adhesive on the conductive tape act as an insulator? Actually, no. I wondered the same thing, but the tape makes very good (low ohmic) contact with the metal. 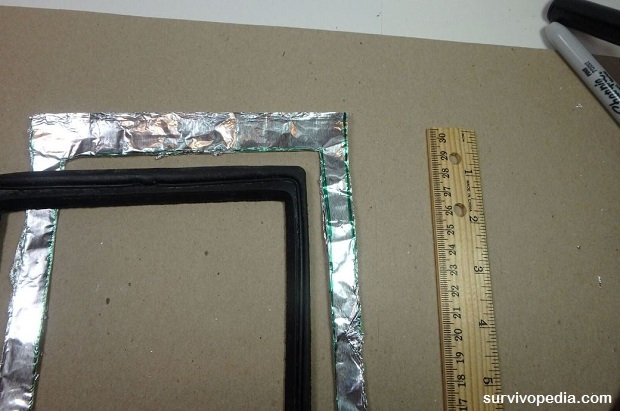 I used both high-quality EMI copper tape with conductive adhesive and compared the performance to much less expensive aluminum duct tape. There was almost no difference in shielding achieved. I’ve noticed that at the local farm store they sell empty paint cans. I would assume that they would work for small electronics. The lid and can are in metal contact all around the edge. Or just pick up some old empty paint cans locally. Would the old dry paint coating the interior be enough for insulation? ONLY A QUESTION . . . On some of the Scientific Studies that I have read for protecting from Solar Flares (Different from Nuclear Burst), they observed that a “tight weave” metal screen was More Effective than Sheet Metal, AND that Securing a Solid Ground connection Was Essential ! There is no need for a Faraday cage to protect from solar events. Those events are very low frequency and do not couple well into small scale electronics. The big risk from solar events is damage to the electrical grid. OK, Thanks Arthur – That Clears Up a Lot ! As long as your electronics are not connected to the grid, they will be just fine in a solar (magnetohydrodynamic) EMP because they don’t have sufficient conductor length to induce enough current to damage them. The reason why they would be affected if they were connected to the grid is that it has thousands upon thousands of miles of conductor length and even if it only picks up a few volts for kilometer, thousands and thousands of volts x the induced voltage per kilometer will destroy pretty much any connected equipment. If we were trying to protect something with as much conductor length as the electrical grid, a pipeline or a railroad track, then yes, we would want a ground, but and equipment that is placed in a Faraday cage needs to first be disconnected from the grid and then placed in the cage and the combination of those two protections means that the equipment will necessarily be protected against either a solar event or HEMP. Thanks for reading and for the question! Why can’take you just use your microwave oven? Good question, and one I don’t have an answer to. Sounds like a good, ready made possibility. If a microwave oven could be used, it might not even need to be modified. Arthur Bradley included a microwave in his lab test. It failed miserably. Check his book on EMP for the details. A microwave oven has some EM shielding, but not typically enough over the entire frequency range we are trying to shield against. When you test shielding, it the dB of shielding provided varies at different frequencies and the shielding in a microwave is optimized for the frequency of energy produced by the microwave. Now, having said that, it every microwave is going to shielded a little differently and even two microwaves of the same make and model may show substantial differences in shielding effectiveness. Bottom line … if you didn’t have anything else it would be better than nothing, but I wouldn’t roll the dice when proper shielding is so inexpensive and/or easy to get. Where can I get XL Faraday bags? Tech Protect is a good source and as near as I can tell, the owner, Ben Gilmore, is a good guy. Any galvanized steel trash can with tight a locking lid (very important) will work as long as there aren’t any gaps larger than 1/4″. Here is a link to one model that I like. For the EMP bags, I get them from Tech Protect. What about heavy duty gun safes? Can they be used as Faraday Cage? I tested a fire safe for my EMP book, and it did a decent job of shielding. The one thing people worry about is if the electronics might fail (which I think is a reasonable concern). If you have a backup keyed way to open it, all is good. If not you might want to drape some emp cloth over the face of the lock (or other shielding material). cOULDN’T ONE MAKE A GASKET OF FINE STEEL (OR BRASS) WOOL TO SEAL, IT? 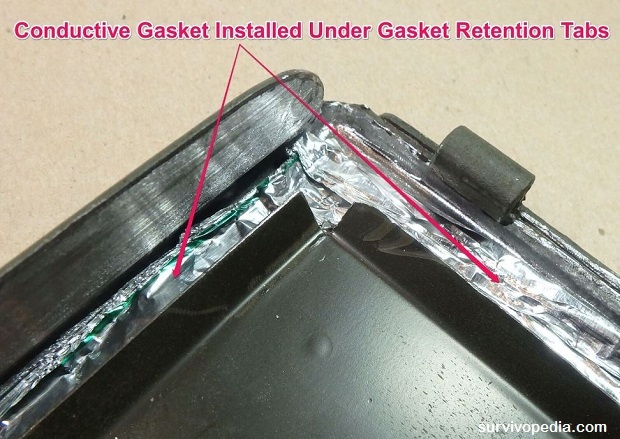 Sure, you can make a metal gasket. In fact, you can buy EMI gasketing and simply cut it to shape. It tends to be rather expensive though.